Licensed healthcare provider impacted by new laws requiring training in suicide risk assessment, treatment, and management? 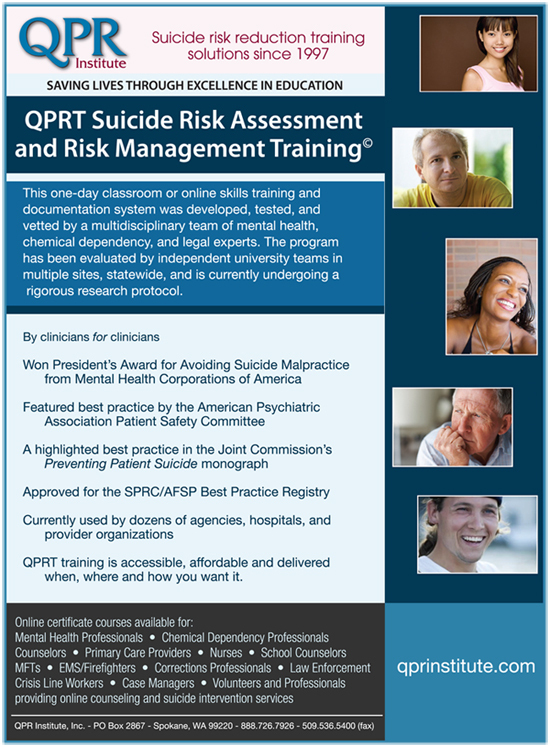 The QPRT Suicide Risk Assessment and Risk Management Training Program offered by the QPR Institute is one-day or online training program that has been heavily-tested, is evidence-based, and a registered best practice training program. The purpose of the Matt Adler Suicide Assessment, Treatment and Management Act (HB2366) is to help healthcare professionals better detect, assess, treat, and manage the thousands of suicidal patients seen each year in a variety clinical care settings across our state, which includes thousands of veterans. Our common ethical standards require all of us to maintain patient safety as our number one priority. And yet, all across America an estimated 32% of adult suicide deaths occur while in active care with a health professional. We hope that whatever training program you select, you can help us reduce the avoidable tragedy of death by suicide. Several registered best practice training programs are available. The QPRT is one. Some training programs are old and tested; others are recent and untested. We invite you to compare and contrast available training programs. Whatever program you select, we are delighted you will be learning more about how suicide can be prevented and helping to improve patient safety. 1. DOES THIS TRAINING PROGRAM MEET THE REQUIREMENTS OF THE MATT ADLER SUICIDE ASSESSMENT, TREATMENT AND MANAGEMENT ACT? Yes. Also, the QPR Institute and its training programs are authorized to award CEs by the National Association of Social Workers, the American Psychological Association, and the National Board of Certified Counselors. Nurses may earn some of their CEs (if required) by completing QPR Institute courses, and most other professions will recognize QPRT training for CEs. If your profession requires it, we can provide our complete course curriculum and vitae for our qualified instructors and faculty, which include MSWs, LCPs, MAs, Ph.D.s, ARNPs and MDs. 2. What does the training cost and is it available online? The classroom single person training course fee is $169 per person, with a volume discounts available. 3. The "expert" question: Was the training developed by expert clinicians in suicidology and suicide prevention, e.g., have they published books or articles on this subject matter in scientific journals? Yes. The lead course author, Paul Quinnett, Ph.D., is an internationally recognized leader in suicide prevention and patient safety, and the author of two books on suicide prevention. Moreover, the suicide risk assessment protocol questions taught in this training program were developed though a multidisciplinary, expert-opinion survey process with input from internationally recognized leaders in suicide prevention and the clinical care of suicidal patients - all widely published experts. 4. Has the training program been peer reviewed or independently evaluated by someone other than the trainer offering the course? As a registered best practice, the QPRT training program has been extensively peer reviewed and tested in a wide variety of clinical care settings over the past 15 years: emergency services, outpatient, inpatient, and residential settings providing services to clients across the age span and in more than 20 states (more reviews below). The training program is currently undergoing an extensive 3-year, federally-funded independent evaluation by the University of South Florida with first publications expected in 2014. 5. Are quality assurance standards in place to maintain the fidelity of this training program no matter who teaches it? Yes. Extensive quality assurance measures are in place to assure high fidelity training. To teach the QPRT program applicants for Advanced Trainer status with the QPR Institute must be experienced mental health professionals or other health professionals with extensive mental health work and meet other minimum qualifications. The train-the-trainer, CE-approved QPRT Advanced Trainer training program requires a minimum of 40-hours of study and successfully passing six separate exams. The training may be a blend of live co-training and self-study, or self-study alone. Strict licensing requirements and quality-control measures are in place to assure fidelity of standardized curriculum delivery. Advanced Trainers are licensed by the QPR Institute only. Participant evaluations are sent to our quality control team showing that all participants attended the full day of training and evaluated it. No Certificates of Attendance are awarded except for a full day of registered participation. 6. As one measure of an evidence-based and peer-reviewed learning experience, is the training program listed in the Suicide Prevention Resource Center's Best Practice Registry? 7. Does the training program offer both knowledge and skill training, e.g., will I have a chance to practice what I learn before I see a suicidal patient? Yes. Our training programs emphasize both knowledge and skill acquisition. Rodolfa, E., Bent, R., Eisman, E., Nelson, P., Rehm, L. Ritchie, P.(2005). A cube model for competency development: Implications for psychology educators and regulators. Professional Psychology: Research and Practice, 36, 347‐354. 8. I work in an inpatient unit. Is the training appropriate for those working in inpatient or residential settings? Yes. Our training team includes physicians, nurses and others with extensive inpatient experience. The QPRT assessment protocol is available for inpatient and residential settings where patient monitoring is required to maintain patient safety. A Hospital-version of the User's Manual is available, together with an inpatient version of the protocol and monitoring options. These protocols have been used for more than a decade in dozens of hospitals and residential care settings. 9. I work with youth. Is the training appropriate for working with teens or even pre-teens? Yes. The QPRT Suicide Risk Assessment and Risk Management training program includes the option of youth-specific pediatric assessment interview protocol, a Pediatric User's Manual - authored by child psychologist, Lou Sowers, Ph.D.. The training and protocol have been used with more than 10,000 at-risk youth with no known adverse outcomes, complaints, or lawsuits. 10. If I like it, can I learn to teach this program through a train-the-trainer option? And, does my attending a training either face-to-face or online count toward becoming a licensed trainer? The QPR Institute offers a comprehensive train-the-trainer program to teach both the QPRT and its step-down QPR Suicide Triage course. Our Advanced Trainer training program is extensive - (40 hours, less the QPRT 7-hour classroom course) - and is an available entirely online. 36 CEs are awarded. We provide a license to train, technical support, a password-protected online resource center, and a revenue share system when you train others. Agencies electing to train their own trainer(s) purchase only materials and certificates ($60 per person) and incur all other costs. Please inquire about our train-the-trainer program. 11. Is the online option flexible, e.g., how long do I have to complete the training? Answer: Online QPRT training is self-paced. Once enrolled, you have one year to complete the training. Downloadable role-plays with instructors are provided for skill practice and rehearsal. A blend of online training followed by a classroom skills enhancement a 1/2 day session is highly recommended. Online training is the most cost effective if you run a busy practice or must travel to a distant training site. The online QPRT training contains considerably more content, brief "pop up" lectures, game-maze interactive challenges and other e-learning experiences unavailable in traditional classroom learning settings. 12. How long is the training and how many CEs are awarded? The QPRT classroom training requires 7 contact hours. The online course - given its various options to explore a variety of topics - is typically 8-10 hours, but up to 14 or more. Eight hours (8) hours of CE are approved. 13. Does the training program test me for what I have learned, or can I simply attend the training to earn my certificate? There is no testing for the classroom training, and Certificates of Attendance are provided with 7 CEs. Online learners are required to pass a final examination at 80% items correct to earn a Certificate of Knowledge Competency (NASW and APA requirements for distance learning courses). As an educational organization, and given the high stakes that a client may attempt or die by suicide if we do not do our very best work informed by the very best science, we believe clinical providers should be examined for knowledge and skill competency in this area of practice. Not only is passing a nationally benchmarked exam an excellent defense against any claim of suicide malpractice, but it provides clinicians with a sense of confidence and competence that they actually know better than their untrained peers. To this end, classroom learners (who are not examined) may enroll in the QPRT Course Review and Examination on our web site and complete a comprehensive course review - including many modules not covered in the day-long training program - and pass a comprehensive examination to earn a Certificate of Knowledge Competency. The fee is $35 and another 3 CEs are awarded. See details at: http://courses.qprinstitute.com. Finally, we do offer online course mentoring, review, and examination by our expert faculty. This extra fee varies by time and profession, but learners may interact with our faculty and, if they so choose, undergo an extensive examination of their actual work in this area of practice for a Certificate of Competency. Contact us for more information. 14. If I am tested for what I have learned, is my score measured against some sort of national benchmark? Our Answer: Yes. Since inception in 1996, the QPRT Suicide Risk Management training program and results from its pre-post or post-training exam has been reviewed, published, or otherwise "benchmarked" by the following organizations. 15. Does the training provide an actual interview protocol I can follow to assess and manage suicidal patients, and has this protocol been peer review or used in clinical settings before? Yes. The interview assessment protocol was developed by an interdisciplinary team of expert clinicians and suicidologists from the American Association of Sociology. The protocol is intuitive, flexible, thorough, and widely tested with more than 250,000 consumers. Sample protocols are included in your training packet and you have a chance to use it during your training experience. 16. Has the training program been recognized by any national organizations as a best practice and, if so, which ones? Yes. The QPRT training program has been recognized by the Joint Commission, the American Psychiatric Association Patient Safety Committee, and was registered in the Suicide Prevention Resource Center's Best Practice Registry in 2010. The training program also won $15,000 as the Winner of President’s Award in Avoiding Suicide Malpractice, Mental Health Corporations of America. 17. Regarding impact on patient safety outcomes, are any data available for this training program having a positive impact on reducing patient suicide attempts or completions? Yes. The Devereux Foundation (America's largest non-profit mental health service organization), and a long-time user of the QPRT, gave the keynote presentation at the 2009 Joint Commission Conference on Patient Safety. 18. By topic, what is does the curriculum include, e.g., substance abuse, vets, domestic violence and suicide, etc.? "[A] one-to-one assessment/intervention interview between a suicidal respondent in a telephonic or face-to-face setting in which the distressed person is thoroughly interviewed regarding current suicidal desire/ideation, capability, intent, reasons for dying, reasons for living, and especially suicide attempt plans, past attempts and protective factors. The interview leads to a risk stratification decision, risk mitigation intervention and a collaborative risk management/safety plan, inclusive of documentation of the assessment and interventions made and/or recommended." (Quinnett, 2010). At-risk populations; elderly, Native Americans, youth, African Americans, males, veterans, and others. The relationship of mental illness to suicide, e.g., risk by DSM IV diagnostic category - major depression, TBI, PSTD, etc. Option to sign up for a complimentary email service on clinical updates in suicide prevention and clinical practice, breaking research, and other matters of interest. 19. What hard copy handouts or materials are included, and are there any ongoing benefits from this training program? Your classroom QPRT training program is complimented and supported by the provision of a copyrighted Users Manual (Adult, Pediatric or Hospital version), key slides from the lecture content (you will not receive a complete copy of the almost 200 slides in this training program), a clinical practice checklist, a patient safety planning tool and document, sample QPRT interview protocols, supplemental files covering a variety of subjects, and your Certificate of Course Attendance with CEs. 20. If any are available, what are the reviews on this training program? There are several large scale reviews of the QPRT training program, perhaps the largest state-wide review was independently conducted by the Child and Family Policy Initiative, Carl Vinson Institute of Government, University of Georgia in 2005. A total of 231 clinicians were trained in across the state. All were pre-post tested on our knowledge exam. To quote from the report on the exam developed here in Washington State and noted above (full report available on request): "The percentage of participants who passed the suicide prevention knowledge test rose from 9% to 83%. There was a ten-fold rise in participants who could pass the test going from 20 participants passing on the pre-test to 200 passing on the post-test. Participants who are able to pass this test are eligible for a knowledge certificate from QPR. They also have passed the first portion of the requirements to become a trainer with QPR. The names and scores on this test are maintained by QPR." Another quote from the Georgia report regarding knowledge gained and skills taught: "The objectives learn a competency-based performance evaluation approach to suicide risk assessment and apply assessment skills through evaluated role-plays were both rated as fully met by 93% of these participants." Understanding risk groups/risk factors, litigation issues, scenarios. Humor! Enlightenment both factually on the topic of suicide and professionally concerning how my own current practice is failing in addressing suicide; change nothing. I love the humor mixed with straight forward matter of fact presentation! Stressing the need to be thorough, to get the information and act on it; I am hoping the next session is going to “close the loop” with more information. This was truly excellent – speakers and material. QPRT training programs delivered by our licensed instructors typically receive an average score of 4.0 or better on 5-point scales across the following training and content related dimensions: Accuracy and utility of content, appropriate to my level of training and experience, teaching methods, visual aids, handouts, and oral presentations. Our instructors are likewise rated positively on the following: Knowledge of the subject matter, taught the subject competently, elaborated where needed, organized, interesting, answered questions effectively and was responsive to questions, comments, and opinions. Who, or what, is the QPR Institute? The QPR Institute is self-sustaining, veteran-owned, small Washington business whose sole mission can be summed up in its tagline: Saving Lives through Excellence in Education. The Institute has trained and certified more than 10,000 QPR Gatekeeper Instructors who, in turn, have trained nearly 1.5 million lay and professional gatekeepers in 49 states and a dozen foreign countries. Our 13 online courses represent the largest single library of self-paced, interactive suicide prevention specific training programs in the world.